That’s the big idea (?) behind this blog. Collegewebeditor.com is an independent, popular, and influential blog about the Web, marketing, and PR in higher education. Launched in February 2005, this niche blog now attracts more than 10,000 unique visitors per month, more than 2,000 readers by RSS feed and close to 2,500 email subscribers, a very targeted audience composed of higher ed professionals and executives. Karine Joly is a Web marketing professional, an expert in social media marketing and the Web editor behind www.collegewebeditor.com. In 2007, she founded Higher Ed Experts , a professional online school for executives and professionals working in universities and colleges around the world. At Higher Ed Experts, Karine oversees the development of the curriculum. She teaches an 8-week online course on Social Media Marketing for Higher Ed. She also designed and taught the capstone graduate online course for the MBA in Social Media at Southern New Hampshire University: Social Media Marketing Campaigns. 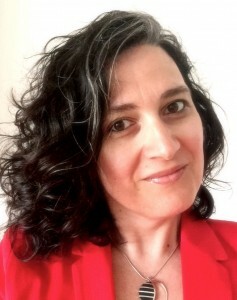 Her professional career spans more than 20 years of experience in communications in the US, Canada and France including 10 years in Web content development, marketing and strategy in higher education. Karine authors the Internet Technologies column of University Business and writes periodically for other publications (University Affairs, CASE Currents, etc.). Karine is a regularly invited speaker at leading web conferences (CASE, American Marketing Association, EduComm, eduWeb, CUPRAP, etc.). Karine was previously Web editor for a liberal arts college on the east coast and worked in the past on selective consulting projects related to social media, Web strategy, print/electronic publication audits for a small number of universities, colleges and schools. Before focusing on Web 2.0 in higher education, she experienced first hand Web 1.0 as a Web editor at About.com, a top 10 Web property that is now part of The New York Times Company. Prior to the dot com boom (… and bust), Karine worked as a journalist for several radio stations, newspapers, and magazines in Europe. She has a master’s degree in communication from La Sorbonne in Paris (CELSA) and a Webmaster Certificate from Rutgers University, NJ. Early adopters explored possible campus use of live, mobile video over the summer. How colleges can funnel visits from home page to admissions and other key web pages. Most institutions think they measure the impact and the performance of social media, but only a few have shown they are ready to invest the necessary time and resources to measure what really matters. Colleges follow a new generation of students on this visual mobile-messaging platform. Predictive web analytics can guide higher ed marketers in charting their course with more certainty. Ignoring these often overlooked agreements could be troublesome for your institution. People are logged in to social media all day—it takes only a click to sign in with social logins. New tools to develop responsive websites. 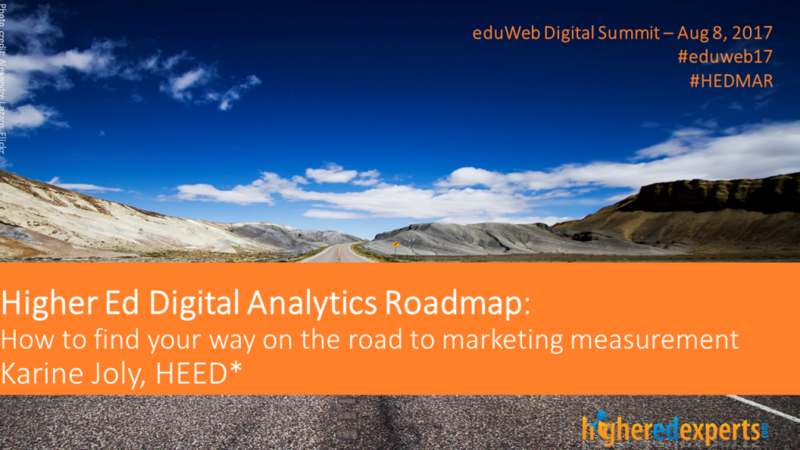 Learn what every higher ed digital analytics professional will soon be talking about. Should institutions dive into Foursquare and other location-based services? Using email service providers for improved deliverability of messages to external audiences. Survey confirms need for web and social media analytics revolution. Why and how to get a web analytics revolution started at your institution. A five-step plan for evaluating web content management systems. More institutions exploring—and succeeding with—mobile web. Six tips for optimizing online videos. A seven-step plan to set up (and benefit from) a simple social measurement program. Words to know in exploring this new frontier in higher education marketing. A five-step plan for assessing and negotiating the transition from print to web publications. Tools, tips, and tricks to revamp or upgrade an institutional website. 7 ways to survive the budget crunch. Real and effective communication, 140 characters at a time. A seven-step plan to raise and nurture any community online. Three questions to ask before switching to a free e-mail solution. Making decisions in the transition from print to digital for campus publications. Eight tips for designing an institution’s crisis web template. New ways higher ed institutions can use social networking. Creating a blog is easy. Making it great requires a plan. TO PRINT OR NOT TO PRINT? That is the question more and more institutions are contemplating when budgeting for their publications targeted to prospective or current students. Higher ed institutions can unleash the power of online videos without breaking the budget. Virtual worlds may wind up breathing new life into teaching, learning, and creative expression. IHEs ponder whether or not to embrace social networking websites. Institutional Public Relations teams may be preventing their schools from getting deserved media coverage. Here’s how the web can help. Web professionals who have “been there, done that” share some pointers. Make the switch to a new content management system as seamless as possible. Admissions-sponsored student blogging can get real results for your institution. Investing in this technology can help get an institution’s news delivered-and read. Ready or not, IHEs must strategize about how they appear in mentions on the web. Universities explore mp3 technology as a new marketing tool. New technologies are changing the way schools get the message out when a crisis erupts on campus. But the most valuable tool in the communications toolkit is still a well-tested plan. Web 2.0 might sound like tech jargon or just another buzzword, but it’s more than that–it’s a paradigm shift in communications that is greatly affecting education. This article defines the term and offers some background, describes how it relates to technology, outlines how and why Web 2.0 affects education, and offers a detailed description of the new mix of marketing and communications channels campuses should consider as part of a strategic communications plan. 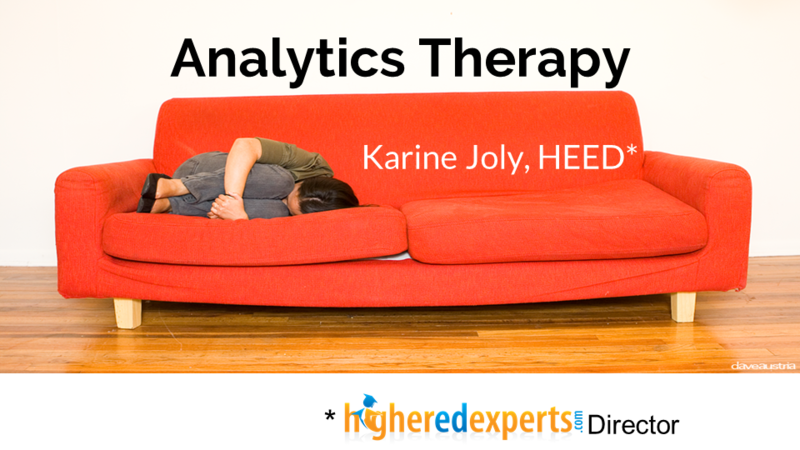 Analytics Therapy: 2-hour workshop on getting started with your communication measurement practice. Analytics Therapy: 3-hour workshop on getting started with your communication measurement practice. “It’s the Community, Stupid! 7-Step Plan to Raise and Nurture Any Community Online – Take 2” First part of a 3-hour workshop about social media. “Blogging Boot Camp” 4-hour Workshop. “It’s the Community, Stupid! 7-Step Plan to Raise and Nurture Any Community Online” Closing Keynote Speech. “The State of Higher Ed Podcasting in the US” 45-minute presentation given via a Web link. “12-Step Program to Better Blogs” 1-hour presentation. “How to Survive PR 2.0…and Thrive in the Brand New World of (Web) Communications” (PDF) 1-hour presentation followed by 1-hour workshop. Union College Concordiensis, October 28, 2010 – Union in Motion: Union’s new video sharing site hits the web. Campus Wired Blog – The Chronicle of Higher Education, September 8, 2008 – “Colgate University Has an Official Twitterer. World Yawns.” by Scott Carlson. University Affairs, August-September 2008 – “Presidents who blog” by Daniel McCabe. The Chronicle of Higher Education, February 4, 2008 – “Study Raises New Privacy Concerns About Facebook” by Jeffrey Young. Campus Wired Blog – The Chronicle of Higher Education, December 6, 2007 – “Colleges Create Offbeat Videos to Try to Build Web Buzz” by Jeffrey Young. University of Maryland News, December 4, 2007 – “The Little Holiday Video That Could”. Southern Arkansas University News, November 14, 2007 – “SAU one of the first to launch new Facebook pages” by Becky Bell.